We held a very special service for the second year running. The residents of Scalford Court joined us for a festive celebration bringing with them their amazing singing voices, accompanied by Sue (Scalford Courts answer to Mr Malone!). 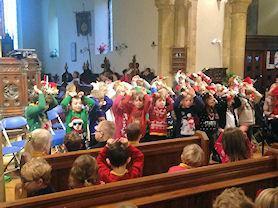 The children all sang beautifully and some ‘spotlights’ shone on children learning musical instruments in school.